This is part of PPP's new report on why moderates win in North Carolina. You can read the whole thing here. In 2002 Elizabeth Dole ran for the US Senate and mostly projected herself as a moderate. She got a great deal of crossover support from conservative Democrats and Democratic women, and fared strongly with independents. She won convincingly. 44% of North Carolina voters identify as moderates, compared to 33% who are conservatives, and 24% who think of themselves as liberals. That adds up to a state that’s about as centrist as it can be, and that helps to explain both why there were so many competitive statewide races this year and also why moderate candidates tend to defeat those who tilt too far one way or the other in major political contests. Candidates like Kay Hagan, Bev Perdue, and Walter Dalton who were successful in high attention races this year are all cut from the same cloth of moderate Democrats who make up a plurality of voters in the state. Of course all things are rarely equal. For instance by this token moderate Democrat Jim Hunt should have beaten conservative Republican Jesse Helms in 1984 and moderate Democrat Terry Sanford should have won reelection against conservative Republican Lauch Faircloth in 1992. The drag of Walter Mondale at the top of the ticket in 1984 and uncertainty over Sanford’s health in 1992 were extenuating circumstances that resulted in exceptions to the rule in each of those cases, and there have been plenty of others. But generally speaking in 21st century North Carolina the above rules should hold true, and it speaks to the fact that both Democrats and Republicans concerned about general election viability should support the nomination of moderate candidates for major offices. Several candidates running for statewide offices in the Democratic primary last spring, including Senate candidate Jim Neal and Lieutenant Governor candidates Dan Besse and Hampton Dellinger, ran campaigns that seemed to be strongly targeted at liberal voters in the party. All were unsuccessful. That can be traced back to a myriad of reasons, but one is quite simple: there just aren’t enough voters who identify themselves as liberals to win with them as your base, even within the Democratic Party. Starting out with a strong moderate base, with an ability to also appeal to either the liberal or conservative wing of the party is the path to victory in a Democratic primary, and obviously a well worn one through the years. It is not impossible for a well funded liberal candidate to win in the primary, but the chances are particularly small if multiple liberals run. There needs to be unity around a single candidate for the more left leaning segment of the party to get someone nominated. A common misconception in reaching out to black voters in a Democratic primary may be that they are all liberals. Our analysis found that is not the case. Black Democrats are actually less likely than Democrats in general to think of themselves as liberals, and more likely to think of themselves as moderates. There was a school of thought last spring that with the contested Presidential primary coming to North Carolina increased turnout from black voters would make it more likely for liberal candidates to win in the other statewide primaries, but this data indicates that appealing to black voters as liberals may not be the best path to earning their votes. There is good news for liberal Democrats. Among folks within the party over 45 just 29% identify as liberals, but with voters under 45 that number increases to 43%. And a majority of Democrats under the age of 30 describe themselves as liberals. There could be a leftward move as the party shifts generations. Why Moderates Win in North Carolina: Republicans: their own worst enemies? -75% of liberals are Democrats, 17% are Republicans, and 8% are independents. -55% of moderates are Democrats, 32% are Republicans, and 13% are independents. The fact that a majority of moderates in the state identify with the Democratic Party speaks to the difficulty Republicans have with casting a broad enough net to reclaim control of state government and, in this most recent election, even to win federal races in the state. -61% of conservatives are Republicans, 30% are Democrats, and 9% are independents. This again speaks to the difficulty of North Carolina Republicans in assembling a broad enough coalition to consistently win statewide races- the percentage of conservatives, who should be the GOP base, that are Democrats is almost equal to the proportion of moderates who are Republicans. -There are major differences in ideological identification between women and men. 44% of women are moderates, same as the population as a whole. But there are more women- 30% -who call themselves liberals than there are conservatives- 26%. Among men the numbers of moderates and conservatives is almost equal- 42% for the former and 40% for the latter. Only 17% of men identify as liberals. -White voters are evenly split between the two political parties, with 44% identifying as Democrats and 44% as Republicans. -82% of African Americans are Democrats compared to 9% who are Republicans, and 9% who are independents. It is going to be very interesting to see what happens with the new chair of the North Carolina Democratic Party. Under the Dome mentions today that Dannie Montgomery, currently first vice chair of the NCDP and someone well known to the activist segment of the party due to her present position, has thrown her name in the ring. Also considering it is Richard Sullivan, a skilled fundraiser and the brother of one of Bev Perdue's main fundraisers. I don't know much at all about either Montgomery or Sullivan, but they both sound like they bring some great strengths to the table. What's going to be interesting to see is whether this becomes a repeat of the 2005 contest for party chair, where the rank and file rejected Mike Easley's choice of Ed Turlington and elected Jerry Meek. Will Perdue's preferred candidate be acceptable to the party activists who have the votes on the matter, or will they once again rebel against their elected Governor's preference and put in somebody perceived as being more committed to the grassroots wing of the party? Perdue certainly has put more effort into courting party activists over the last year than Easley had in 2005, the product of a contested primary and a different personality. But it's very unlikely party leaders will give her choice a rubber stamp unless he/she is clearly committed to the kinds of bottom up initiatives that have made Meek wildly popular with party activists. There was concern when Meek was first elected about whether he would be a strong enough fundraiser to keep the ship running smoothly. Four years later it is clear he has done an outstanding job of building the party both money wise and people wise. The new chair needs to be someone who can continue to successfully juggle both of those party functions. It will be interesting to see how all this plays out, and how Perdue plays her cards. If the person she puts forward is not elected NCDP chair that would be an early blow to her Governorship that she can surely do without. Since the days where the Governor can just dictate the chair may have passed with the results of the 2005 election, it means she's going to have to really go to bat for her preferred choice with party activists and convince them that he or she is the person who can ensure continued success at the level North Carolina Democrats enjoyed in 2006 and 2008. One thing's for sure: this is another place where Easley has made Perdue's job harder. If Easley had held enough sway four years ago to get Turlington in place, the custom of the Governor being able to almost exclusively control this process may have continued. While gender has become an issue in the Colorado Senate vacancy process, it's interesting to note that when we did our survey of who voters in the state thought should be appointed a couple weeks ago even female voters didn't show a high level of support for a female candidate. 8% of all voters preferred Diana Degette and 2% of all voters wanted Cary Kennedy. Among female voters those numbers were just slightly higher, with 9% wanting Degette and 3% for Kennedy. Female voters had pretty much the same preferences as the general population- 22% for John Hickenlooper, 16% for John Salazar, and 11% for Andrew Romanoff. Polly Baca, Joan Fitz-Gerald, and Swanee Hunt weren't being mentioned as prominently at the time we conducted our poll so we didn't include them. The results of our survey from a few weeks back are here if you didn't see them the first time. I'm kind of amused by the handwringing among some media and pundits about the pace at which Bev Perdue is announcing her cabinet appointments. Is that really concern about whether she's doing something wrong, or just the product of folks coming off an exciting election needing something to amuse themselves during a long, boring December? Taking the time to get it right is a heck of a lot more important than feeding the need for the chattering class, so I think Perdue has it right. Two years from now no one's going to remember how fast Perdue announced her team, but they'll sure know if someone wasn't sufficiently vetted or thought through and they screw something up. Hopefully she's taking the time to make sure she's picking a well balanced team that will show she means business about changing things in Raleigh. If she takes all this time and then announces a status quo roster of appointees, that will be the time to whack her. One thing we know for sure from this process: this is a team that doesn't leak. It's amazing how little substantive information has come out, and that shows a good amount of discipline on the part of her team. Moore following the McCrory model? It's hard to imagine just deciding to run for the Senate in 2010 in November or December 2009. Usually a run would require a good deal more preparation than that, and indeed Moore's primary campaign against Bev Perdue was already getting pretty tense in early 2007, if not earlier. But Pat McCrory's January entry showed that you can put together a viable statewide campaign in a short period of time. McCrory decided to run when it was clear that the Republican field wasn't inspiring anyone, and he was able to win the primary even in just four months because his opponents were so weak. It seems highly unlikely, especially after the Democratic successes this year, that the Senate field wouldn't look a lot more formidable than the trio of clowns that were the Republican choices for Governor this time a year ago. But Moore's statements seem to leave the door open that if for some reason high profile Democrats passed on the Senate race and left a mediocre pool of potential contenders in their wake, he might come in at the last second like McCrory did and give his party a stronger contender. I doubt it will play out that way, but there seems to be some element of that in how Moore is playing this. Last week came the bad news that North Carolina may actually not get a new Congressional seat in the next round of redistricting. We're pretty much right on the edge. That's not a huge shock, even though we remain one of the fastest growing states in the country, since we just barely got a new seat the last time around. One positive I can see if we don't get another one: maybe our redistricting process could stay out of the court system for a change next time around! Somehow I think it'll find its way there one way or another. Right now the Congressional delegation is 8 Democrats and 5 Republicans. I have a hard time seeing Democrats doing a whole lot better than that. If NC does get a 14th seat and Democrats still control the process, they may be better off using that power to play defense than trying to create another Democratic seat. Namely, the 7th district and 11th districts, represented by Democrats Mike McIntyre and Heath Shuler would be somewhere between borderline and Republican favored whenever those guys move on. The 2nd and 8th districts are by no means inevitably Democratic seats either. The most useful thing for Democrats to do should the 14th seat become a reality may well be to shore up what they already have to ensure those four seats remain in Democratic hands, rather than getting greedy and trying to push the balance to 9-5. Not every election is going to go as well for the party as the ones in 2006 and 2008. But it may be a moot point...we shall see. I spent Saturday in Charlotte watching UNC and West Virginia face off in what I choose to refer to as the Charlotte Bowl, and spending the day around all of those West Virginians got me thinking about the state more politically. I remember when we put up our final poll showing McCain winning the state by 13 there were a lot of comments around the blogosphere to the effect that it was the most racist, backward state in the country. Obama actually did better with white voters in West Virginia than in two states that no one is calling backward, and he did almost as well with them in WV as he did in Florida. Obviously the reason Obama got plowed in West Virginia even though he did better with whites there than in some other states that he won or got closer to winning is that there are almost no black voters in West Virginia. I guess you could call that a product of racism but it's more because a) there were almost no slaves in West Virginia to keep living there once they were emancipated and b) it wasn't exactly a hotspot for migration when blacks were moving out of the south en masse in the early and middle parts of the 20th century. I wouldn't call it one of my favorite states but I'm not sure WV deserves billing as one of the most racist places in the country. I do wish their football fans would smoke a little less though, I felt like I'd smoked a pack by the end of the game. I'd never seen so many people smoking in one place, and remember this is North Carolina. No wonder legitimate survey researchers have trouble getting folks to pick up the phone and answer their polls! I told Maggie and Annie their idea of Christmas Day fun was making our job that much harder. Tongue in cheek of course...Merry Christmas to everyone from the PPP team. -Two districts, the 2nd and 8th, flipped from 2004. Those districts have a lot of similarities- certainly predominantly rural in terms of overall geography, but each takes in a number of heavily black precincts in one of the state's two biggest cities. -Another pair of districts with Democratic Congressmen continued to vote Republican for President, and did not show that much movement toward Obama relative to Kerry's performance in 2004. In the 7th Obama lost by 5 relative to 12 for Kerry and in the 11th Obama lost by 5 relative to 14 for Kerry. Sometimes folks within the party grumble that Mike McIntyre and Heath Shuler aren't progressive enough, but they're the kind of Democrats who can win in their districts and I certainly wouldn't trade 'em for anything. -The district with the least movement relative to 2004 was the 10th, where Obama lost by 27 after Kerry lost by 34. That makes Daniel Johnson's performance looks all the more impressive even though he still lost by a lot, and unfortunately it also speaks to why that race is probably a nonstarter for the Democrats moving forward. I'm going to have some more on this tomorrow. Last week we wrote about one of Roy Cooper's biggest strengths as a possible 2010 Senate candidate, his ability to win over white Democrats who can often go either way when it comes to federal races. Another of his key pluses as a candidate, on a somewhat related note, is his ability to win over voters in eastern North Carolina. Bev Perdue saved her campaign by doing well there, leading 60-38 in the 252 area code on our final pre election poll. Barack Obama put in a performance that was just good enough to allow him to pull out the statewide victory, 54-46. Erskine Bowles, on the other hand, significantly underperformed for a Democrat in the region, and that's why Richard Burr's running for reelection right now. Strength in the east can often make or break a candidate's chances. If Cooper runs, the Nash County native is primed at this point for a very strong performance on his home turf. Right now he leads Burr 45-28 there. Allocating the undecideds, that puts him on track for over 60% there at this very early stage. Democrats who cross that 60% threshold are going to be statewide winners 95% of the time. Cooper's profile as a moderate, law and order Democrat, as well as a native of the region gives him a strong appeal to eastern North Carolina voters. If he runs in 2010, they may well flip the balance to send him to Washington. It is beyond me why pundits like Charlie Cook and Chris Cillizza think that David Vitter is one of the most endangered incumbents in the country for 2010 while not even putting Richard Burr in the top ten. The reality is that for his personal foibles, Vitter is still pretty popular and the Democrats in Louisiana have no bench. I'll be surprised if whoever the Dems put up is even able to hold Vitter below 55%, even if his poor personal choices are dredged up ad nauseum. Why would Charlie Melancon want to give up what's become a pretty safe House seat for a Senate race where his chances would be iffy at best? Burr, on the other hand, has consistently low approval ratings and is already losing a match up to potential challenger Roy Cooper. Even if Cooper doesn't run there is no shortage of strong potential candidates the Democrats could put up. Beyond that North Carolina just went blue across the board, including the resounding defeat of a Senate incumbent once thought to be invincible. Louisiana stayed solidly red at the Presidential level, dumped two Democratic members of Congress (granted there were strange circumstances for both), and saw its Democratic Senator reelected by a tighter margin than any other in the country. The political climate in NC is much better for Democrats. I think this race has to be considered in the top five of potential seat shifts in 2010, if not even in the top two or three. At least Nate Silver, as usual, has a clue about the relative competitiveness of these races. I think some folks need to get outside the Beltway more. If Richard Burr does better at the polls in 2010 than David Vitter, I'll be happy to eat crow. But I would be shocked. Salazar Departure Good for Colorado Democrats? Could Ken Salazar's move from the Senate to Interior Secretary actually be a good thing for Colorado Democrats? The conventional wisdom is that an open seat gives the opposite party a good chance to take it back. But Ken Salazar's approval numbers weren't exactly out of the park when we gauged them over the summer. And when we tested him in potential match ups against Congressman Tom Tancredo and former Governor Bill Owens he led just 49-37 and 44-41 respectively. Denver Mayor John Hickenlooper and Congressman John Salazar, the top choices of Colorado voters to be appointed as the state's new Senator, each do a good deal better in possible contests against Tancredo and Owens than the departing Senator did. Hickenlooper leads Owens by 14 and Tancredo by 17. He wins independent voters by almost 30 points in either scenario and also wins nearly 20% of the Republican vote while holding the Democratic base pretty much in place. Salazar leads Owens by 9 and Tancredo by 13. Like Hickenlooper, he has a strong advantage among independents voters and peels off a decent number of Republicans. If appointed it looks like either Hickenlooper or Salazar would enter the 2010 race in good position to be reelected, at least against this pair of potential foes. I've seen a fair amount of discussion since the election about whether pollsters 'fixed' their final poll to bring them more in line with reality, and more specifically whether organizations purportedly biased toward one candidate or another were particularly guilty of this. The line of thought is that a Democratic organization might have tried to 'help' Obama by cooking the polls for him throughout October but then showed the race closer at the end, or vice versa, so that their final polls were as accurate as possible. I know we didn't do that, and I don't really think any of our competitors at least in state level polling did either. If you look at our polls and their demographic composition by the three things we weight for, which are gender, race, and age, I don't think you're going to see a whole lot of difference between what our projections were on the last poll and what they were on other surveys we did in the same states in September and October. In five states we showed movement toward McCain, in three movement toward Obama, and two no difference. On average we showed McCain doing about half of a percentage point better in our final poll compared to our second to last one, hardly evidence we were 'fixing' our polls. 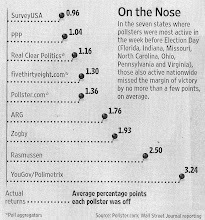 Interestingly, in two of the three states where we showed the biggest movement between the final two polls we were about the only polling company to do so. Nobody had Obama winning New Mexico by as much as us, and nobody had him losing West Virginia by as much as us. In both cases our final judgement ended up being the most accurate, and it's worth noting again that the movement we found in those two states actually headed in opposite directions. Our only goal, whenever on the calendar we were conducting a poll, was to give the most accurate picture of the race at that time we possibly could. -He said he's interested in going into the money management business. -He said he had no specific plans for future electoral office. -He said he didn't think the timing was going to work out for a run against Richard Burr. -He expressed a feeling that he needed more of a break from campaigning/electoral politics than an immediate Senate run would give him. He left the door open but my sense from the interview is that he doesn't have the fire in his belly to wage a tough statewide campaign two cycles in a row. The most relevant part about his 2010 plans is from the 17 to 19 minute mark. He also didn't sound like someone who felt like mending a lot of fences, blasting SEANC and defending the 'Confederate Hats' ads he ran against Bev Perdue in the closing days of the Democratic primary. You have to figure if he was really thinking about a Senate race he'd be looking to mend fences with those constituencies. As I wrote two weeks ago, I think not running in 2010 would be the prudent choice for Moore. But maybe he'll surprise us. It's hard to be surprised by anything in politics after the past year. When it comes to the question of who should replace Ken Salazar in the US Senate there isn't much consensus among Colorado voters, with support divided relatively evenly among the candidates being most commonly mentioned. Denver Mayor John Hickenlooper leads the way at 23%. One thing that's interesting about his support is that he gets the most support among Democratic, Republican, and independent voters at a steady 23-24%. That's different from, for example, New York where our polling finds that Democrats prefer Caroline Kennedy but other polling shows Republicans prefer Andrew Cuomo. Hickenlooper's support is steady across party lines. Hickenlooper is the favorite in the Denver metro area at 26%, followed by Andrew Romanoff at 13%. In the rest of the state John Salazar is the top candidate at 25% with Hickenlooper receiving 19% support. One thing to note about the results is that while Hickenlooper leads overall, the number of voters saying they would like to see John Salazar or Federico Pena appointed exceeds his level of support. That could be an indication that a plurality of voters would like to see a Hispanic candidate appointed. That's certainly the case within the Hispanic community, where 32% say their top choice is Pena with 18% saying it's Salazar. Romanoff gets 16% with Hispanics and Hickenlooper falls further back at 11%. The divide among Hispanic voters about whether they'd rather see Pena or Salazar appointed falls largely along regional lines. Denver area folks prefer Pena while out state ones want Salazar. Of course this decision is ultimately up not to the voters, but to Governor Bill Ritter. We tested Ritter's approval and found that he gets relatively good marks. 49% of Colorado voters like the job he's doing compared to just 36% who disapprove. He predictably does well with Democrats and poorly with Republicans, but has a solid 50-34 spread with independents. As Caroline Kennedy meets with leaders in Upstate New York today, a new Public Policy Polling analysis finds that's where she's weakest when it comes to popular support from Democrats across the state. Statewide Kennedy is the top choice of 44% of New York Democrats to replace Hillary Clinton, followed by Andrew Cuomo at 23%. Although Kennedy is the top choice in the Upstate as well, that support is not as strong as it is in New York City and its surrounding areas. 36% there would pick her, compared to 22% for Cuomo. Kirsten Gillibrand and Brian Higgins, who get only 6% and 5% statewide, receive 11% and 13% respectively in the Upstate. Kennedy gets her strongest support in the suburbs, where she's the top choice of 57% of Democrats compared to 24% for Cuomo. In the city itself the numbers pretty much mirror what they are statewide: 45% preferring Kennedy and 25% for Cuomo. If Kennedy is looking to shore up her popular support as she tries to get David Paterson to pick her, the Upstate is the place to be. There are a lot more Democrats in North Carolina than there are Republicans. Always have been, and the advantage is so large that it's likely to remain so at least for another generation. Of course that doesn't mean that Democrats always win statewide races, especially at the federal level. That's because there are a lot of folks on the more conservative spectrum of the party who vote Republican for key offices like President and Senate. Even this year, which was remarkably successful for the Democratic Party in the state, a lot of white Democrats voted Republican for President, Senate, and Governor. Our final pre-election poll found Barack Obama winning white Dems 71-28, Bev Perdue winning them 71-25, and Kay Hagan winning them 76-21. Exceptional black turnout made the Democratic sweep at the top of the ballot possible, but it begs the question: are Democrats going to be able to knock off Richard Burr in 2010 if turnout returns to more standard patterns? It all depends on who their candidate is, and if it's Roy Cooper the answer is yes. In the Burr/Cooper poll we conducted last week Cooper led 63-16 among white Democrats. Extrapolate those figures out to 100, and it's an 80-20 lead for Cooper with white voters in his party. In other words that margin is five points better than the one Kay Hagan had with white Dems, 14 points better than Perdue's, and 17 points better than Obama's. For the most part a Democratic nominee who gets 80% of the white vote in his/her party is going to win statewide in North Carolina, even with a much more normal turnout than what we saw in 2008. Cooper's record and profile have given him the popularity within his party to make that a possibility, and that's why he's the Dems' strongest possible candidate in 2010. After what was by any measure a disastrous election cycle for Republicans in North Carolina, there has understandably been a lot of handwringing among the party's activists about what needs to be done to turn it around. In 2002 when Elizabeth Dole generally came across as a moderate, she won big. In 2008 she came across as a mean, old conservative devoted to party above state and got walloped. Pat McCrory, another relative moderate, came closer than anyone else could have to getting elected Governor as a Republican this year. When we tested possible general election match ups in February McCrory was tied with Bev Perdue while Bill Graham and Fred Smith, each perceived as more conservative candidates, trailed her by 12 points a piece. As a Democrat, I was hoping fervently that Fred Smith would win the Republican primary. Bev would have won by double digits if he had. The two Republicans who have managed to get elected Governor hardly projected as right wingers. Yes, Jesse Helms was very successful for a long time. But that was in 20th century North Carolina. The state's face in the 21st century, as we saw last month, is quite a different story. I hope the NC GOP roots out its moderates because that would ensure another generation of Democratic control in the state, as well as continued success for Democrats at the federal level. But it's hardly a winning strategy if they really want to turn their party around. With it now becoming clearer that Caroline Kennedy is a serious possibility for New York's US Senate vacancy, it begs the question of whether a Kennedy appointment or an Andrew Cuomo one would help Governor David Paterson score more political points. The answer is that it's a wash. We found last week that Paterson has a 68% approval rating with New York Democrats, a strong performance to be sure. But what about the third of folks in his party who either disapprove of the job he's doing or are unsure...could appointing either help him to win over those folks? The answer is no. 43% of Democrats who don't approve of Paterson's job performance want Kennedy to be picked, while 22% support Cuomo. Those numbers are virtually identical to the preferences of the population at large, where 44% are for Kennedy and 23% would choose Cuomo. There's no meaningful difference between who those who aren't sure about Paterson want appointed and who those who are happy with the job he's doing would like to see get the Senate seat. That's just more confirmation that with high approval numbers Paterson should be able to appoint who he thinks best for the Senate seat without having to worry too much about political repercussions in one direction or another. The two states that voted on Tuesday — Indiana and North Carolina — are so unimportant to Democratic chances of electing the next president that it is unlikely Hillary Clinton or Barack Obama would make more than a token appearance in either after one of them is nominated. Of course Barack Obama ended up spending quite a bit of time in- and winning- both. I dredge this up not to make Broder look bad- I don't think much of anyone except the Obama campaign itself thought those victories were possible at that point- but as another reminder of just how improbable and remarkable some of Obama's successes this year really were. When I reviewed all the folks we tested against Elizabeth Dole over the course of 2007 last week, I missed a couple. In June we found that Bev Perdue would trail Dole 46-37 and that Richard Moore would start out at a 45-34 deficit. If I recall correctly we tested them simultaneously against Dole because there was a sense among Democratic leaders and activists at the time that it was wasteful that two strong candidates were duking it out in a nasty primary contest for Governor while the Senate race remained untouched. With the news now that Moore might be considering a run for the Senate, you really have to wonder how much better off his political career would be now if he'd just decided two years that he wanted to be a Senator. With the benefit of hindsight it seems pretty likely he would have won considering how fragile Dole turned out to be. A Moore candidacy would more than likely have kept any other serious Democratic candidates from running, and folks would have been happy with him for preserving party tranquility by avoiding a divisive Gubernatorial primary and also for stepping up to the plate to take on Dole. If Moore ends up running and getting the Democratic nomination in 2010 he will certainly be a formidable candidate. But his best shot at being elected to the Senate has probably already passed. Who will make a better President? Barack Obama may have only won North Carolina by the smallest of margins in last month's Presidential election but when it comes to who the state's voters think will do the stronger job between him and the current President, it's no contest. North Carolinians think Obama will be better than George W. Bush by a wide margin. What's particularly striking about this is how consistent the sense that Obama will be better is across demographic lines, even with groups that weren't particularly supportive of him in the election. For instance a majority of senior citizens and a plurality of white voters think Obama will be better than Bush even though each group supported John McCain by a pretty good margin. Voters across all age, region, race, and gender groups that PPP tracks believe that Obama will prove to be a better President, as do almost 20% of Republicans and, by a 54-33 margin, independent voters. It's not hard to track this optimism for Obama, once again, back to the economy. 65% of voters who say it's their top priority think he'll be an improvement compared to just 26% who think Bush will prove to have been the better President. It will be interesting to see how much breathing room the voters give Obama before they start expecting to see tangible results from his policies. One of the most interesting things about our poll from earlier this week finding that Caroline Kennedy was the top choice of New York Democrats to replace Hillary Clinton was her support from black voters who grew up during the time her father was President and her uncle was serving the state as a Senator. Among black voters who were born between 1943 and 1962, 65% listed Kennedy as their top choice and 29% listed her as their second choice for a total of almost 100% saying she would be one of their picks. No candidate earned anywhere near that level of support with any other demographic subgroup of the population. John and Robert Kennedy were certainly very popular with black voters, and more than 40 years later it appears the affection African Americans in New York feel for the Kennedys remains. "I live in NC and let me talk about the pollster Tom Jensen. He is one among the reasons, McCain lost North Carolina. Till last 4 weeks, McCain was ahead by 3 to 5 points. This guy consistently released polls on the presidential elections and everytime he appeared on the big triangle radio market to brag about the closeness of the race. Also, it looks like, he was responsible for making Obama campaign move the resources from Georgia to North carolina. In addition to it, he collaborated with Democratic national committee to spend million on thrashing Dole. She did not respond quickly and it is another story. Now, Tom jensen is setting the stage for the next election. He is trying to influence the election by encouraging the Democratic National Committee to again spend millions to win this senate race." Little old me, personally responsible for the demise of Elizabeth Dole and Barack Obama's win in the state. Who knew? Certainly news to me! As Elizabeth Dole prepares to leave the US Senate, her popularity with North Carolina voters is at an all time low. For the first time a majority of people in the state view her unfavorably. What is perhaps most remarkable about these numbers is that a full quarter of Republican voters now have a negative opinion of Dole. Few self identified Republicans voted for Hagan last month so a lot of folks must have cast a Dole ballot while holding their noses. To get an idea of how whatever bipartisan appeal Dole might have had is gone, consider this: in February 2008 24% of Democrats approved of her job performance while just 16% of Republicans disapproved. When there are more folks in the opposite party happy with what you're doing than there are people in your party who are unhappy with what you're doing you're usually in good shape. But ten months later those figures for Dole have pretty much flipped: 25% of Republicans see her unfavorably, while only 15% of Democrats look at her positively. When it comes to whether they think Hagan or Dole will make the better Senator, 52% pick Hagan compared to 35% for Dole. The optimism for Hagan spans all demographic groups by race, gender, age, and region. Voters also trust the new Senator more to be able to do something about the economy- 60% of folks in the state who list that as their top issue think Hagan will do a better job compared to just 25% who say the same of Dole. It's remarkable how far Dole's esteem with North Carolinians has fallen in just six years. The movement has a blog. Don't know who's behind it, but I think it's safe to say Roy Cooper is uniquely qualified to appeal to voters across the ideological spectrum- he's a rare politician that both liberal Democrats and conservative Republicans I know have a great deal of respect for. If Attorney General Roy Cooper decides to run for the Senate in 2010, you can put Richard Burr's name right to the top of the list of endangered incumbents nationally. Cooper leads Burr by five points in a hypothetical pairing. He also has a similarly high profile to Burr, with only 34% of voters in the state having no opinion about his job performance, compared to 37% who are ambivalent about Burr. It is quite unusual for a lower ranking state official to start out with similar name recognition to a US Senator. Cooper is also much more popular with a 21 point net positive approval rating, compared to Burr for whom it is only a single point. Cooper has considerably more appeal across party lines than the incumbent. While Burr's approval among Democrats is -30, Cooper's with Republicans is only -6. To put into perspective just how good this early standing is for Cooper, keep in mind that when PPP first tested Senator-elect Kay Hagan against Elizabeth Dole during the summer of 2007, Dole led Hagan by 16 points. Of course that number can also serve as a warning to any Democrat who runs against Burr- things can change fast in politics. We'll break this poll down further in the coming days. Full results here. How malleable was the electorate?